Several times, when talking about windshields, I've badmouthed the "cop" shield. I've likened them to bad '70s sitcoms and been unabashedly derogatory. Well, I won't eat my words, but I might nibble at the edges, because Slip Streamer's Mini Police shield ain't half bad. I think it's the "mini" that makes it. Rider's get the authoritative look of the classic Harley police shield, but toned down for the everyday rider. If you don't think it'll fit an occasion, it can be removed in seconds, so you can ride naked (your bike, that is... you really shouldn't ride naked). The fasteners consists of stainless steel straps and anodized aluminum hardware. This keeps everything light, strong, and rust-proof. At 14.5 inches wide and 15 inches tall, the Mini will be just enough to stop the wind from hitting you like punches to the chest. You'll still get airflow up to your helmet to help prevent fogging and heat. 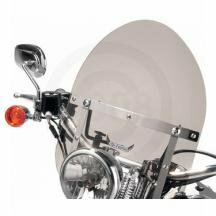 Available in clear or smoke tinted, you can get the Mini Police shield for a wide range of handlebar styles and sizes. I would be inclined to get the smoke tint. I still can't quite get into the police style, and the smoke strikes me as less cop-like. In all honesty, there is a reason the police shields looked the way they did. It's a highly functional design and will do what it's made to do, and for a reasonable price. Not a great price, but a reasonable price.